Prior to 1938, each borough had its own awards program. Brooklyn moved many of the awards that could be earned at their Kanohwahke Scout Camps located at Bear Mountain Parks in NY to Ten Mile River. 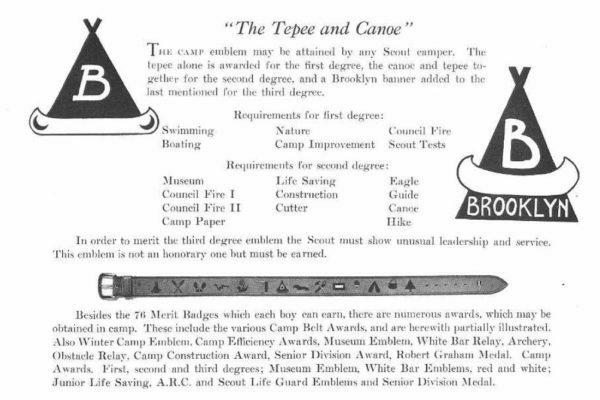 The primary award was the Teepee and Canoe a series of three degrees earned by campers by completing various requirements. 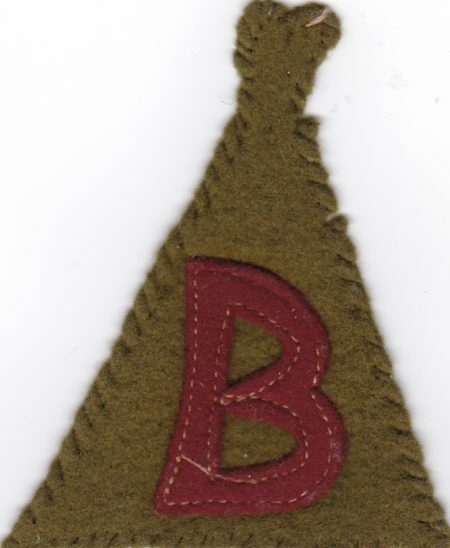 The first degree was the Teepee with a B for Brooklyn in the camp colors Khaki and Maroon. Here is a sample of the requirements from the 1929 Camp Guide. the images are for the Second and Third Degree patches. The versions from Kanohwahke Scout Camps had a different color scheme orange and black, still looking for those. Let me know if you have any for trade or sale. This one allowed me to check off one of my TMR Staff Neckerchief needs. Sometimes months go by without seeing one, but this is my most recent acquisition. 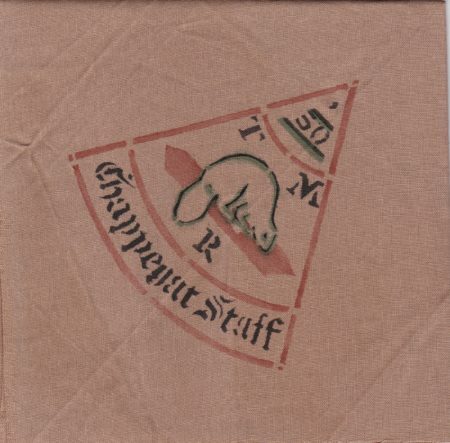 Camp Chappegat, was part of the Brooklyn Scout Camps at Ten Mile River Scout Camps. It was located on the Delaware side of the camp. It eventually closed, but parts were used by ‘greater’ Kunatah for many years. Picked up this neckerchief at the Lenapehoking TOR in Allendale earlier this month. Thanks, Frank. Camp Sam Wood served as the primary camp for Genesee Council and is still being used today under the management of Iroquois Trails Council. 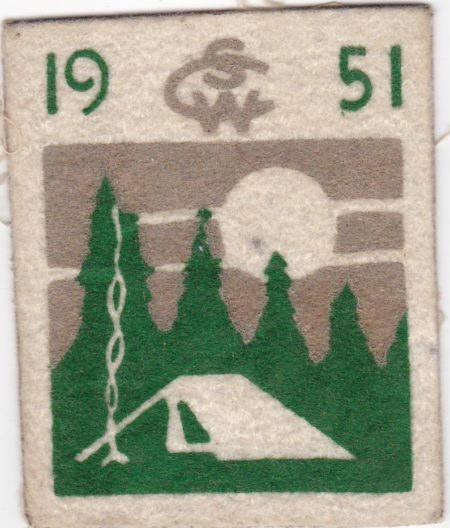 Here the 1951 pocket patch from Camp Sam Wood. Does anyone else have any images of old Camp Sam Wood issues? 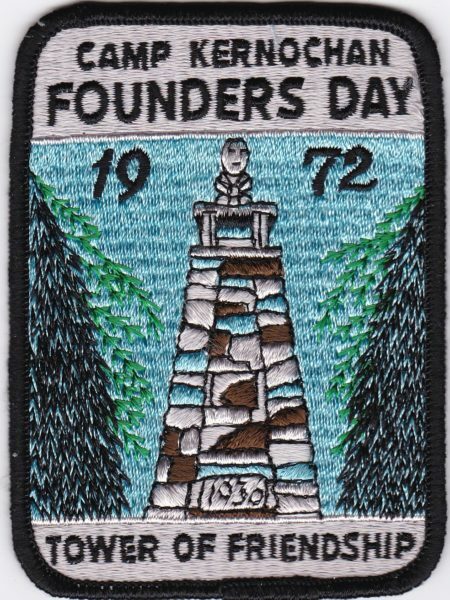 For the first time since 1974, TMR did not issue a Jacket Patch, but did issue a pocket patch with a variation of the Indian Cliffs design. The patch did feature the native American Chief on Indian Cliffs, but rather than overlooking the Delaware River Valley, it overlooks the NYC Skyline. This may have been the first use of Mylar thread on a TMR Patch. 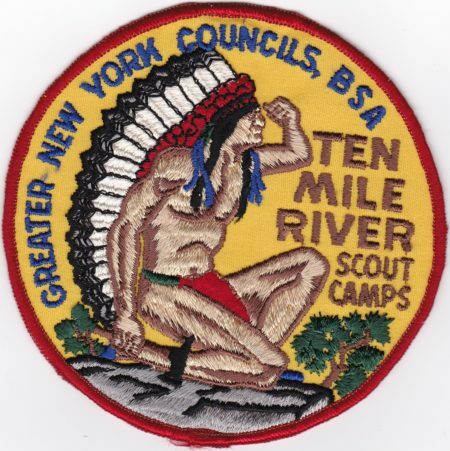 1972 was the 45th Anniversary of Ten Mile Rive Scout Camps. Atlantic District in Brooklyn had chosen Camp Kernochan as the site of its district camp. I was SPL of Troop 296 at the time and John Romanovich was Camp Director. As part of the Anniversary Program, John Ramonovich held a Founders Day celebration on the parade grounds while Atlantic District was in camp. A patch was issued for the event. 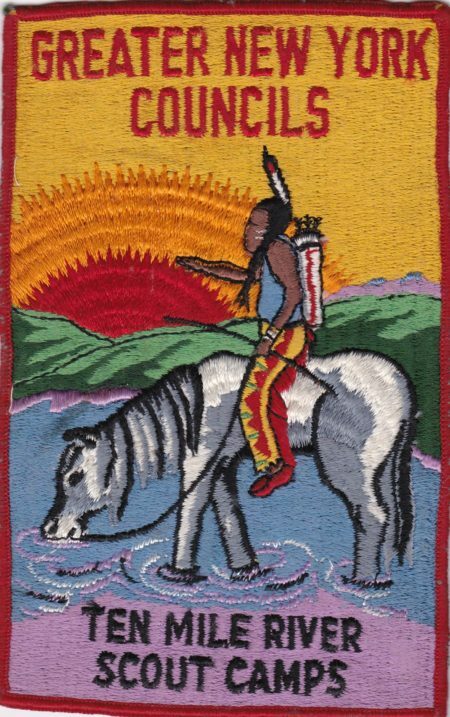 This was one of the few Camp patches issued by an individual Camp as most were issued at the reservation level. 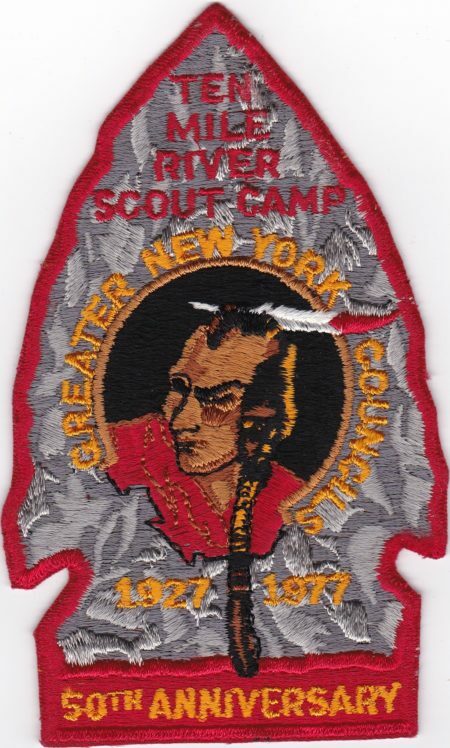 It wasn’t until 1975 when patches were regularly issued with the individual camp names. Are you aware of any other individual TMR camp issues from the 1960’s or early 1970’s? 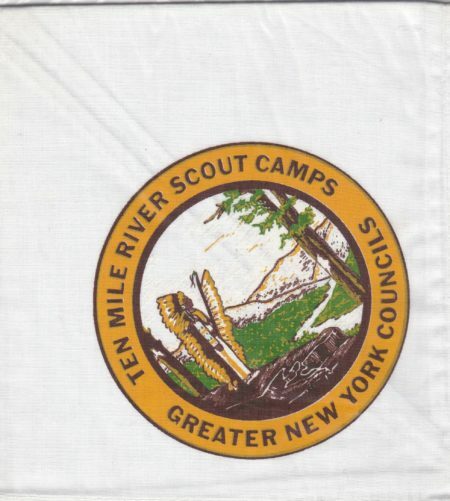 I had previously written about a 1977 Staff Patch issued for the 50th Anniversary of Ten Mile River Scout Camps. Here is the regular version which was available for sale to all. Some wore it a shoulder patch on the right shoulder. During its earliest years at TMR, each borough operated its own independent camp(s). Things began to change in 1938 when Alfred C. Nichols became the Director of TMR. 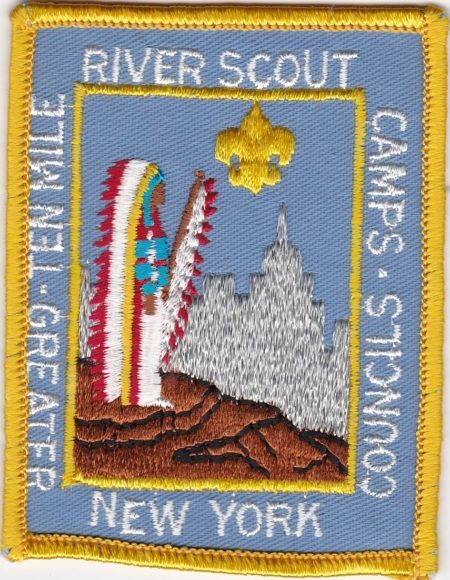 A standard reservation‑wide program called the TMR Scout Award replaced individual borough awards and recognition programs. This program was designed around four of the program areas offered at camp. A Scout would earn a basic Award, then awards in individual program areas. Each Scout had a record book where his progress towards each award could be measured; these books were issued with at least 3 different colored covers (tan, green. and blue) and with varying page counts. 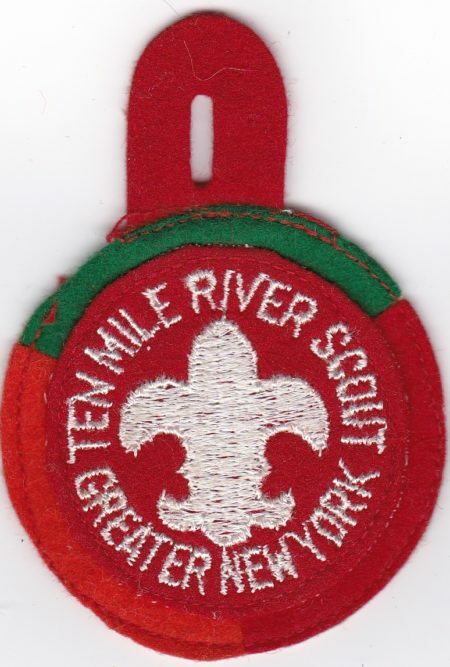 The booklet was entitled Ten Mile River Scout Symbol of Good Citizenship. Here is a tricolor version issued for completing the requirements in each program area. This is one of my favorite non-Indian Cliff Jacket Patches which was issued by TMR back in 1971. I believe it was the first fully embroidered Jacket Patch issued by TMR. There are at least two versions of this patch. The top layer of the Sun in this one is Orange, there is also a Yellow Sun Version.